I just wanted to post a quick note here on the subject of family photography, archival photograph storage, labeling images, etc. Before I start, I want to take a few minutes to remind you all of a few things just in case you haven’t been committing everything I’ve said up until this point to memory. 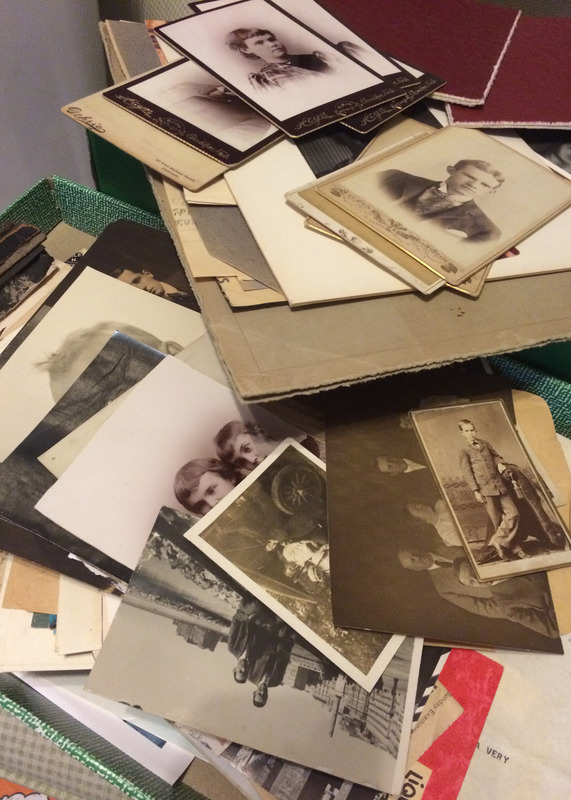 At said university in said course of study, I learned the proper way to handle, store, love, nurture, care for, and archive precious family photographs. Ok. Now that we have that out of the way, I would like to reveal a dirty secret here. Now, I am on the path to fixing this. My office right now. Since you can’t actually tell, this stack is actually a cardboard box. And the 12″x18″ box is about 7″ deep. There are literally hundreds of unlabeled photographs in this box. Some are from the 1990s. Some are from the 1860s. This is a GIANT undertaking! Pictures of people I didn’t know I had (yes, I found ANOTHER photo of Hot Great Grandpa! The more time I spend with these people, the easier it is to tell who they are. I am not 100% sure that I can identify to 100% certainty who everyone is! So, Here’s my disclaimer from this moment going forward.